No. 148 Piccadilly was one of three houses erected on Crown land leased to Lord Bathurst (of Apsley House). Soane also carried out repairs and alterations for Tollemache to Coombe House, Surrey, 1782 and the door may have been for that house. There is a copy (by John Sanders, a pupil in Soane's office from 1 September 1784 to 1790) of 'Description and Estimate of sundry Repairs and finishing / prepared to be done at a house in Piccadilly, adjoining Earl Bathurst / for Wilbraham Tollemache Esqre / July 1781'. This includes repairing, re-fitting and cleaning virtually everything from roof to basement at a cost of £827.00. The list includes, re-laying slates, cleaning gutters, re-pointing gables and parapets, replacing chimney pots, laying lead flashings, re-laying and strengthening floorboards, stiffening joists, re-fitting skirtings, base mouldings and architraves, re-hanging sashes, shutters and doors, cleaning chimneys and re-laying chimney slabs, cleaning and lacquering locks, cleaning windows, seeing to water closets, disposing of all rubbish and much more. Apart from these practical tasks, 'ornamented Cielings & Entablatures [were] to be painted in various / colors, & four historical subjects painted for the Ovals in the / Cieling of front room, & two circular pictures for the Cieling of the / Drawing Room next Hyde Park; & the whole of the woodwork / to be painted Dead white.' No fixtures were included in the estimate. 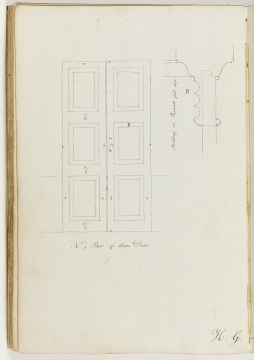 Soane's Note Books from July 1781 to March 1784 have many references to Mr Tollemache and his house, mainly concerning payment to workmen and others including including 'Pearce's wife for cleaning the house - 8 days 1.0.0.' (25 May 1782). An unpublished typescript article by Dorothy Stroud (written 1953, SM green box files: Soane) quotes information from Soane's Notebooks and other MS material which shows that building works were being carried out (at intervals) to 148 Piccadilly from 1782 to 1798. P.Dean (op.cit.) gives an account of 146-8 Piccadilly (and of related Soane Museum records). Nos 147-148 Piccadilly were rebuilt as a palazzo for Lionel de Rothschild in 1861-2 and demolished with neighbouring mansions for the Park Lane dual carriageway in 1972.